The memories of both World Wars have faded in the minds of many Canadians. 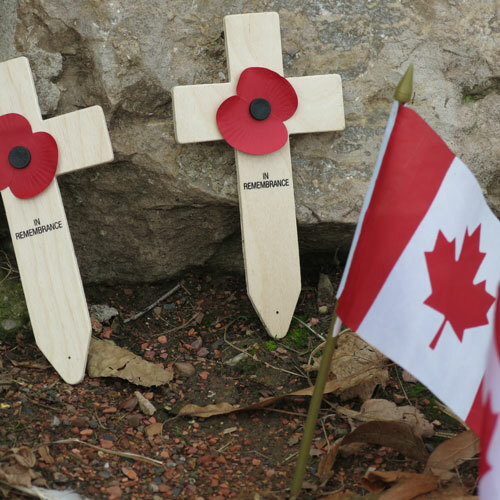 It is only on November 11th that we stop to pay tribute to the Canadian Veterans who left for Europe and for many whose lives were sacrificed to bring freedom to the people of Europe. One would assume that the contributions of Canadians and other Allied troops to the war efforts has faded and been lost in the minds of the French people. To the surprise of 14 Canadian tourists, this is not the case. 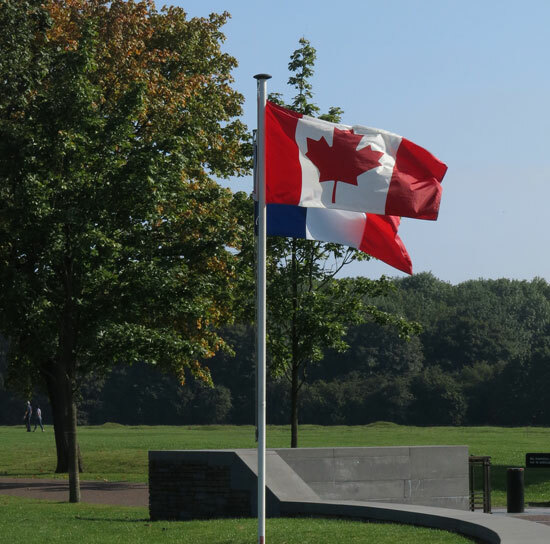 On September 22, 2013, our Canadian Battlefield tour group was continuing our visits to the battlefields and cemeteries of both great wars. 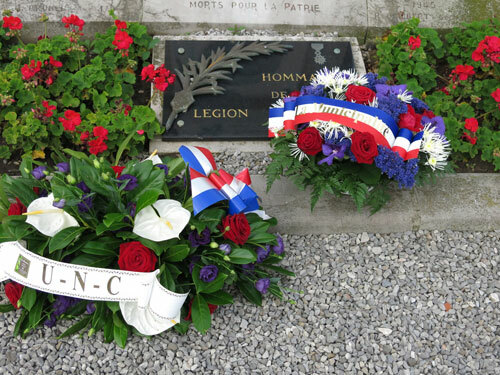 In the morning of this day, we visited the public cemetery in the French town of Wimereux. 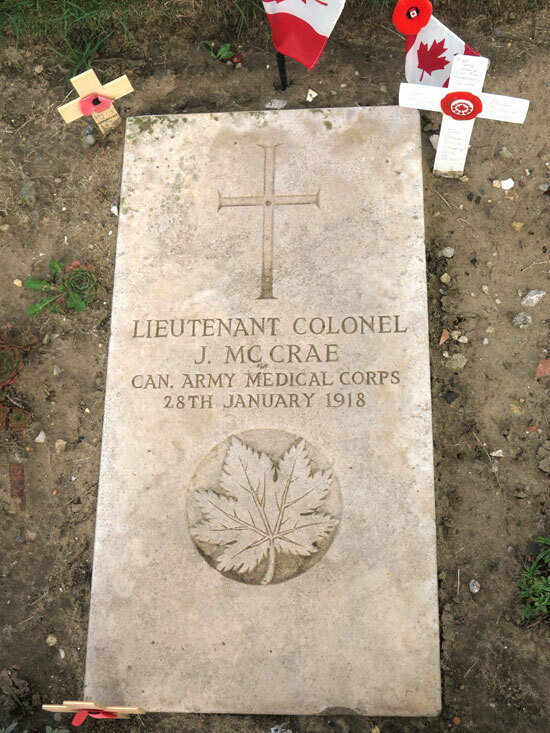 It was in this Commonwealth War Graves Commission section of the Wimereux Cemetery that we discovered John MacCrae’s grave marker. It was his famous poem of “In Flanders Fields” that he received worldwide fame. As noted by remembrance crosses and Canadian flags, his gravesite is regularly visited. 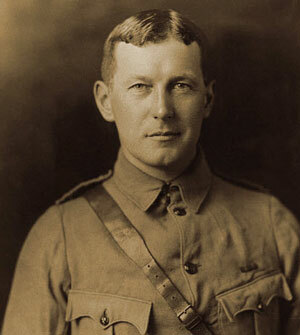 Unfortunately, John MacCrae contracted pneumonia and died on January 28, 1918. 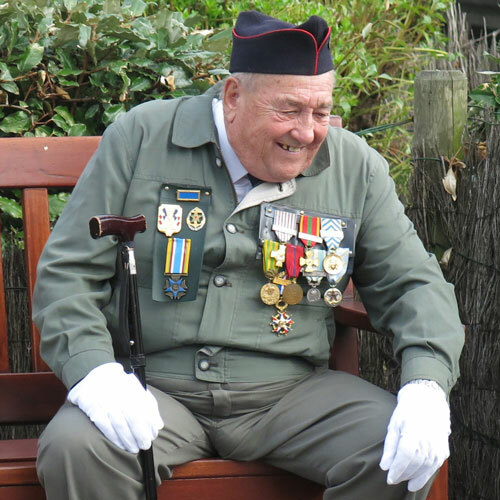 A story of his life and contributions can reviewed at – Read a tribute article. After completing our visit to the cemetery, we drove to the town center of Wimereux for the purpose of locating washrooms and having a coffee. As our driver negotiated a parking spot next to the canal, we noticed a crowd of town people gathering around a war memorial. The crowd consisted of: 40 uniformed band members; a dozen war veterans wearing multiple medals; and 40-50 onlookers. Out of curiosity, most member of our tour group decided to oversee the ceremonies. Kathy Sutherland asked a woman standing nearby about the ceremony. 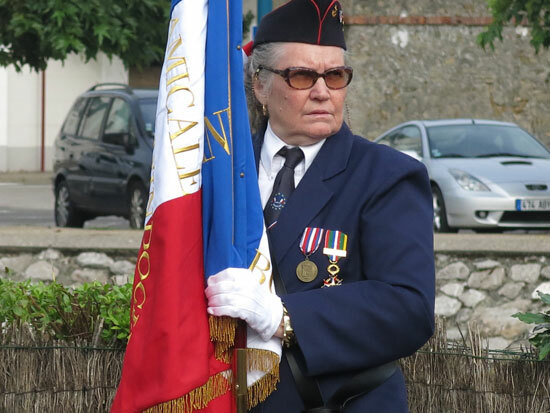 In her broken French, the woman explained that it was their Liberation Day from the German occupation during World War II. According to the woman, the town celebrates this day each year and pay special tribute to the Canadian Soldiers who recaptured the town from the Germans. The ceremony began with a moment of silence for the Canadian 3rd Division soldiers who died during the days to liberate their town. The Mayor paid specific thanks to Canadian soldiers of the: Fort Garry Horse Regiment; Nova Scotia Regiment; and Le Regiment de la Chaudiere Regiment. A moment of silent was paid to the fallen Canadians followed by the band playing the French Anthem (La Marseillaise) with the French veterans saluting. To the surprise of our tour group, the band immediately began playing the Canadian anthem. It was at this moment and unexpectedly that all members of our tour group joined together to loudly sing with pride our national anthem. Wreaths were laid at the foot of the town’s memorial. It was at this time that the woman who spoke to Kathy Sutherland advised the mayor that we were all from Canada. The mayor then publicly acknowledge our presence and thanks us for attending this special day of remembrance. After the ceremony, the mayor approached our group to personally shake our hands. As we departed the town, Bruce Bennewith outlined that “this recognition for Canadian soldiers killed and the singing of the Canadian anthem made him so proud to be a Canadian.” The sentiment of Bruce was share by all members of our group. 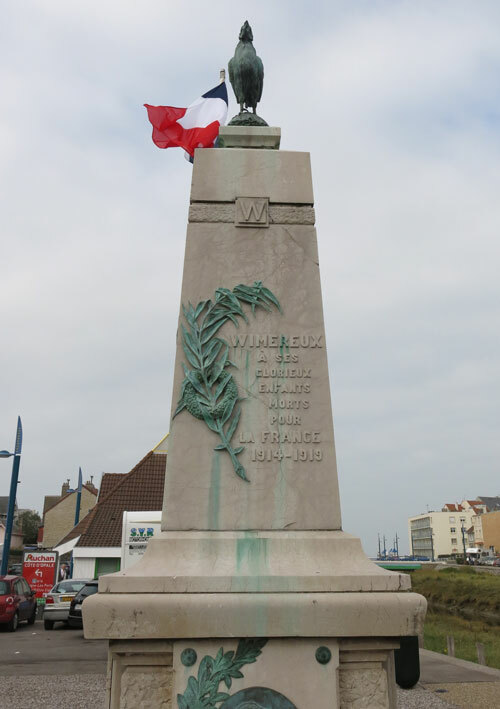 Wimereux France was one of the England Channel ports designed by Adolf Hitler as a fortress and would be heavily fortified by troops committed to fight to the end. Despite the fanatical dedication of the German troops, the Canadians prevailed. Clearly, the French people of this town appreciate and recognize the sacrifices made by Canadians. With these annual Liberation Days, the town’s people will ensure the contributions of Canadians will not be forgotten. For our tour group, we were all extremely proud to be Canadians!